This blog post was co-authored by Lauren Bonilla and Rebecca Empson. We present some general observations, visual images, and emerging research findings from our time together in the mega-mining region of Omnogobi, Mongolia. What does the economy look like from a place that has driven so much of Mongolia’s recent economic, political, and social transformations? 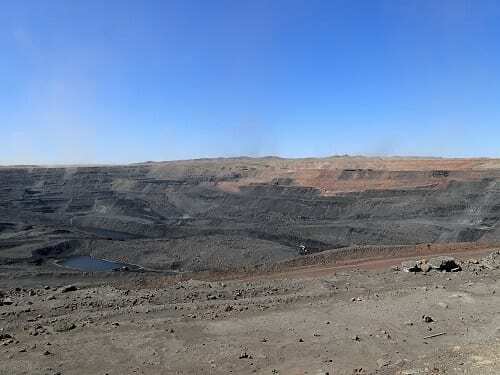 In early May, we had the chance to explore this question together in the vicinity of the two biggest mining projects in Mongolia: Tavan Tolgoi in Tsogttsetsii and Oyu Tolgoi in Khan Bogd (both located in Omnogobi aimag, or South Gobi province). Lauren was already in Tsogttsetsii conducting research on the social and environmental dimensions of the mining industry slowdown in Mongolia. This research mirrored her PhD work in 2011/2012, a time very different than today, when mining activities were rapidly expanding. Rebecca traveled to Omnogobi with her friend Huyagaa, his 7 year old son Othuu, and his nephew Javkhaa, to visit Lauren and to look at some of the mining projects in the region and their effects on the social and geographical landscape. Tsogttsetsii is acutely suffering from the recent downturn of the global mining industry and the sharp decline in coal prices. The three companies that operate the Tavan Tolgoi deposit – Energy Resources (listed as Mongolian Mining Corporation, or MMC, on the Hong Kong Stock Exchange), Erdenes Tavan Tolgoi (ETT, a state-owned miner), and Tavan Tolgoi Joint-Stock Company (a locally-based mining company in operation for fifty years, locally known as Little TT) – have all scaled back operations since the mining economy began slowing down in 2014. Nowadays, life in Tsogttsetsii is characterized by waiting. Waiting for coal prices to get better and revamp mining activities. Waiting for salaries and job opportunities like during the boom time. Waiting for a railroad to be built so that coal can be transported to China more cheaply and with less impact to the environment and pastureland. Waiting for the parliamentary election season to pass so that big decisions can be made by the government, such as the future of the state-owned owned portion of the Tavan Tolgoi deposit. 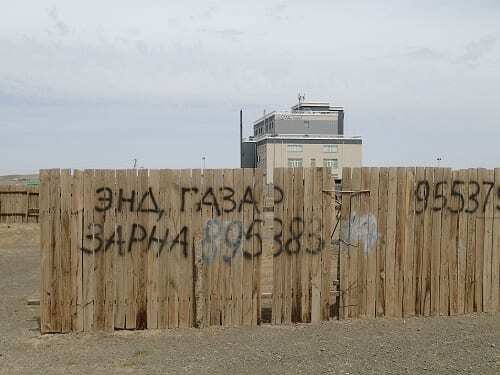 Fences throughout Tsogttsetsii are painted with the words, ‘Land for Sale’. In the background stands a high-end hotel built by an Ulaanbaatar-based hotel and restaurant chain. 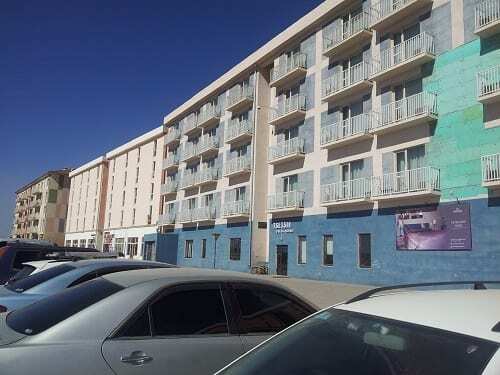 Locals say that it ‘went bankrupt’ after only a year of operation in 2013. 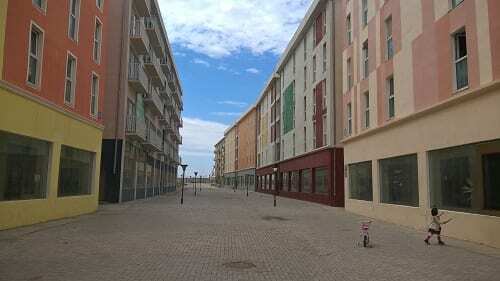 One of many empty businesses that are ‘For Rent’. People have been especially waiting for Energy Resources to restart their mining operations at the same capacity of previous years. Where local business and people once had regular incomes, the suspension of mining at Energy Resources’ mine in spring 2015 triggered a sharp economic downturn in the once and briefly flourishing district center, with many enterprises going bankrupt or struggling to survive. Because Energy Resources’ operations are located in close proximity to the district center, with the families of most workers living locally in an apartment complex called Tsetsii Town, Tsogttsetsii on the whole feels the impact of the slowing mining economy vis-à-vis Energy Resources more than the other two companies. Tsetsii Town built by Energy Resources. 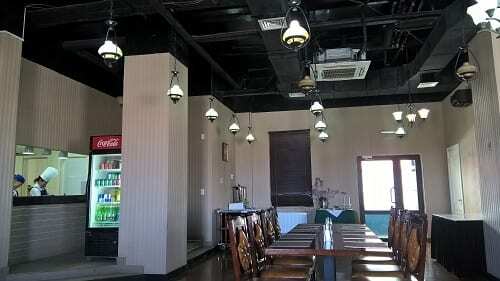 Most of the first floor business spaces remain unoccupied. The posh restaurant attached to the Tsetsii Guesthouse. Our time together in Tsogttsetsii coincided with the re-opening of operations at Energy Resources. The company kindly accepted our interest to visit the Ukhaa Khudag mine site, the electrical power station, the coal handling and preparation plant, and the water reservoir, as well as their offices, recreational area, and staff accommodation (called ‘gallery camp’). Experiencing these different spaces offered us an inside glimpse of the life of mining during a slowdown. For we learned that it’s not just the scale and pace of mining that changes, but also the practice of mining itself. Reading the economy from the lines of the Ukhaa Khudag mine. The section to the left was constructed when the mining economy was good, whereas the right section was constructed more recently. Entering the cool, tall, dark building of the coal washing plant (called CHPP by Energy workers), we were struck by the intense noise and the shuddering movement of machinery as raw coal enters, is crushed, washed and transformed into higher-value coking coal to be exported to China to fuel its steel industry. The plant is bathed in a low yellow light and the black sludge of wet coal coats everything. As we made our way up multiple floors of precarious metal stairs, observing each step of the industrial process, the thunderous buzzing of machinery and the constant movement of wet black sludge turned into different shapes and textures created a thrilling experience. We could not help but wonder at the ingenuity of the coal washing process, something that might seem to be a simple process of bathing black rock in water. The sheer scale of things gave the sense of being in a giddy Vertov film. Inside this dark, wet, intense hub of activity, the atmosphere starkly contrasted with the vast, dry, still, open, and quiet vistas of the Gobi desert, the slowdown of mining operations, and the prolonged sense of waiting among people. In contrast, the electrical power station was warm and still and buzzing with three massive turbines and large computers tracking all aspects of electrical production. Long open corridors flooded with light lead to larger rooms with huge pieces of machinery that gave off lots of heat and low electrical noises. 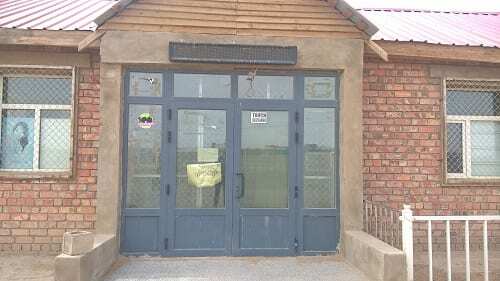 In these connecting corridors the young male workers had cultivated seedlings in pots and containers, making the inside feel more warm, green, and more spring-like than the outside. In contrast to the coal washing plant, where men wore heavy dark suits splattered with black coal, this building was run by delicate-looking young guys with glasses wearing immaculate jeans and shirts, and sitting on swiveling chairs in spotless computer rooms. One got the sense that once programmed, the technology took over and the workers had a lot of time on their hands. Indeed, when we peered at one screen we noticed that it said it needed to renew their programme license. The computer command center at the power plant, enlivened with plants along the window. On our visit to the water reservoir, we could see millions of dollars’ worth of coal transport trucks sitting idle in the distance. Though Energy Resources resumed operations, they had not begun exporting again to China. 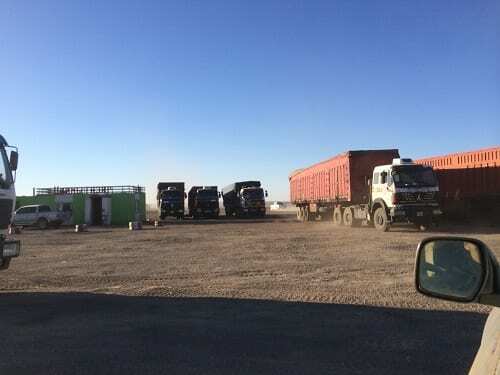 We were told that ETT and Little TT continued to transport raw coal daily to China on the Gobi toll road that Energy Resources constructed in 2011 and which the state took ownership of in 2014. The number of large trucks using the road was supposedly fewer than in the past, making for easier driving south to the Oyu Tolgoi mine (even though the road itself had never been designed for the transport of such heavy loads). These trucks moving back and forth with coal to China are now not so much the hopeful manifestation of national economic growth, but clouded in suspicion and dread, and associated with murky ownership and outsourcing of labour, as well as the slow trickle of the constant repayment of loans and debts. Fleet of Energy Resources’ coal transport trucks sitting idle. We decided to make the most of time in the Gobi together and visit Oyu Tolgoi for the afternoon. Finding the paved Gobi road proved somewhat difficult, as trucks marked with the ETT logo, accompanied with additional logos in Chinese and English of subcontracted transit companies like Chalco Winsway and GobiTrans, drove bumper to bumper on a winding dirt road that crisscrossed with other dirt roads. Huyagaa picked one of the roads that brought us past small tire repair shops, food canteens in dust-coated gers, and disabled coal trucks in varying degrees of disrepair. Tire repair shop and vehicles stopped for unknown reasons near the Gobi road. Huyagaa wedged his way into a long line-up of ETT trucks waiting to pay the toll. Between the massive coal trucks, our SUV felt like a toy car. This feeling was compounded as we drove on the road, where we had to navigate around trucks overtaking each other within frighteningly short distances of oncoming traffic and trucks broken down in the lane. 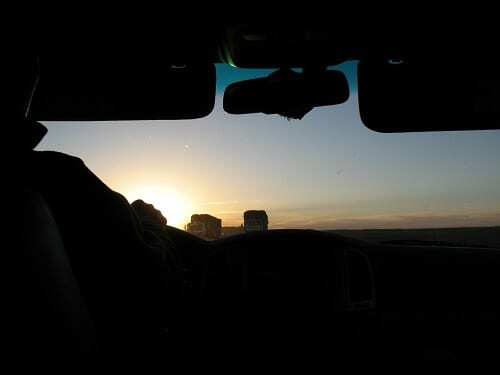 Lauren later told a director at Energy Resources that driving on the road was more terrifying than any other driving experience she had in Mongolia. He shook his head and lamented that the road was not built to be used for very long nor to carry such sizable loads and host this many trucks. It was meant to be a temporary transport infrastructure to China to be replaced by a railroad in 2012. However, because of politics, the railroad has yet to be constructed even though from our car we could see land prepared for track beds and fenced areas rumored to contain rusting railroad parts. Trying to get a spot in the toll line on the Gobi road. The small white car ahead operates a small store selling soda, chips, and cigarettes. Some of the risks of the road are caused not so much by infrastructure, but by the nature of the Gobi coal mining economy. Most of the trucks driving on the road are hauling coal from ETT, but they are not owned by the company. Rather, we were told that they are subcontracted by small individual companies that provide little to no protection in case there are accidents. A person narrated one story to us of an upturned truck that spilled its coal onto the desert. Rather than risk calling for help from the company because the driver would have money deducted from his salary, he garnered help from others to re-load 100 tons of coal by hand in the dry, hot, and dusty desert. 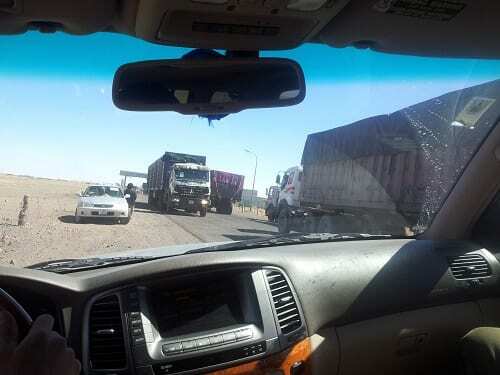 We all hold our breath and grip our seats as Huyagaa quickly pulls off the Gobi road to avoid a collision with an oncoming coal truck overtaking another truck in our lane. What was surprising to us was the sheer number of trucks on the road. In Ulaanbaatar, one gets the impression that coal mining at Tavan Tolgoi has stopped or been radically scaled back because of news stories about Energy Resources’ default on its $600 million in foreign debt and internal financial problems at ETT that triggered a man to set himself on fire at a press meeting to protest the transfer of ETT mine work to a lower-cost Chinese company. Moreover, ETT has yet to fulfill an agreement it made with China’s Chalco in 2011 to deliver coal in exchange for a $250 million prepayment. 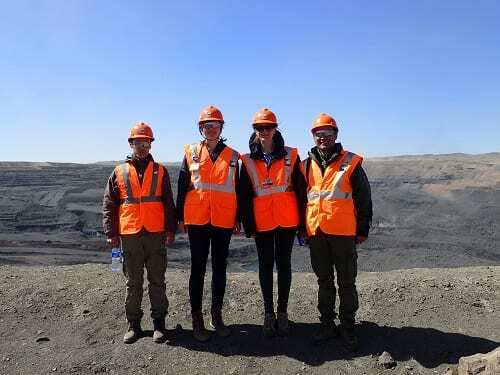 Huyagaa, like many of the people from Tsogttsetsii who Lauren engaged with during her research, observed that in the current economy of low coal prices, the outstanding agreement between Chalco and ETT means that Mongolia’s coal is going to China for next to nothing. He suspected that people may be selling more than what they are saying and taking a profit for themselves. 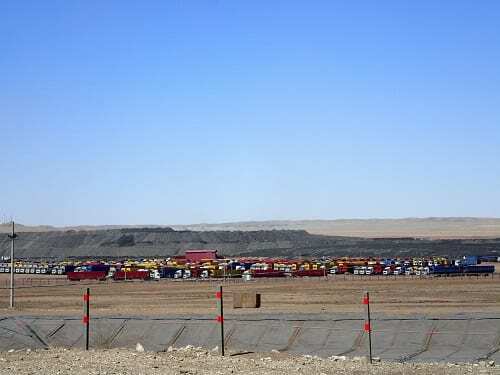 Lauren added that because of the high costs to transport coal along the Gobi toll road, it is more like Mongolians are paying China to take their coal. Whereas Tsogttsetsii was once a place people described as experiencing ‘energetic development’ (erchimtei högjil), where everything from people, moneys, minerals, and earth felt like it was on the move, now it is a place where things are moving but that movement is not tinged with expectation and hope but rather disillusionment and discontent. This is a landscape of national debt, of slow and heavy repayments which no one is able to stop, and of future visions now lost, or changed forever. The future that will emerge is uncertain, and this is reflected in the stalled projects, the half running guest house, and the trucks moving some of the world’s most valuable coal at seemingly little to no economic benefit. Uncertainty also looms large hundreds of kilometers away from Tavan Tolgoi in Ulaanbaatar. While we were in the Gobi, we heard about Mongolians in Ulaanbaatar gathering at street corners in the middle of the night to sell their state-allocated shares of ETT to foreign, though especially Chinese, buyers. One foreigner recounted driving down a typically peaceful side street in Ulaanbaatar in the middle of the night while coming home from the airport, and being mobbed by dozens of young men desperate to sell him the Tavan Tolgoi shares that they received in 2011. 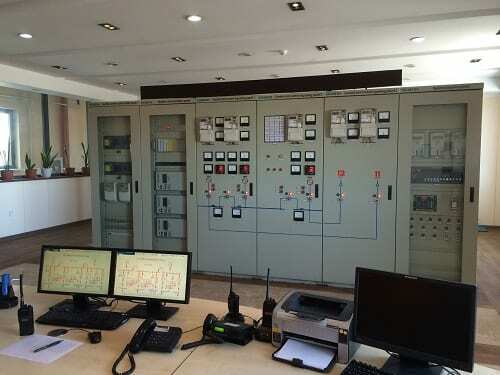 The news reported that this was a scam, since rules to protect people from being taken advantage of by shrewd buyers prevents citizens from transferring their Tavan Tolgoi ownership to others. While writing this blog post, however, we learned that the government has proposed to buy a third of each citizen’s shares for 300,000 MNT, or $150. In the current economic climate of crisis this is not an insubstantial amount of money, but it seems paltry when compared to what these shares represented when they were released to all citizens five years ago. The Financial Times ran an article at the time about how these shares would turn all Mongolians into millionaires. Yet, now, these shares seem like yet another promise that has failed to materialize as expected. In November, ten researchers part of the Emerging Subjects project at UCL and the National University of Mongolia will travel together to Tavan Tolgoi and Oyu Tolgoi. We hope that we will learn how the changing mega-mining landscape in the Gobi articulates with our various ethnographic research areas and ultimately helps to shape the nature of capitalism in Mongolia – the topic of a conference we will organize in the fall, with more details forthcoming. All photos © of Lauren Bonilla and Rebecca Empson.